A vigorous, disease resistant variety created by crossing a California cherry-plum and a winter-hardy dessert plum. 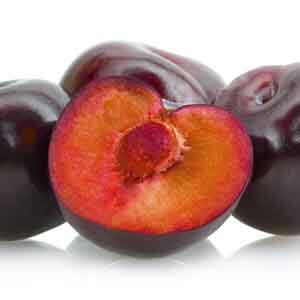 Produces an abundance of gorgeous deep purple-skinned, freestone plums with sweet red flesh. Plant a different variety of plum tree within 50’ (15m) to ensure pollination and the best fruit production. Plums ripen 2-3 weeks earlier than other, similar plum varieties. U.S. Plant Patent #16,621. Also known as the variety 'Lydecker'. Produces fresh fruit for a delicious and nutritious snack. The perfect addition to any fresh fruit tray. Best used for large scale plantings.